Applesauce, though, is a constant in our lives. Every year we lighten the groaning branches of the apple trees in the fall, piling box after box of apples into the house. 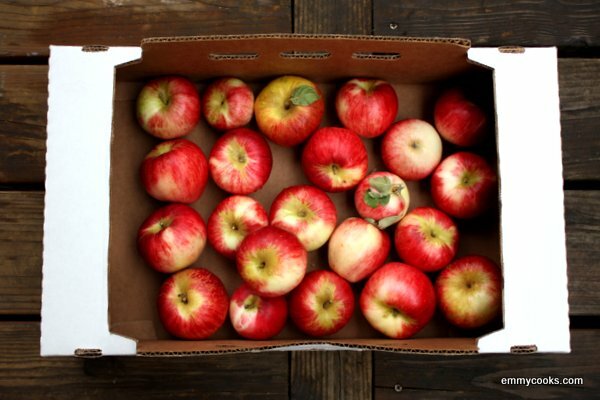 We sort the apples, setting aside the unblemished best for eating and sharing. We eat and bake and dry as many apples as we can. And the rest become applesauce for the year ahead. Do you have a kitchen ritual that marks the turning of the seasons for you at this time of year? And do you keep a journal of some sort, in the kitchen or otherwise? 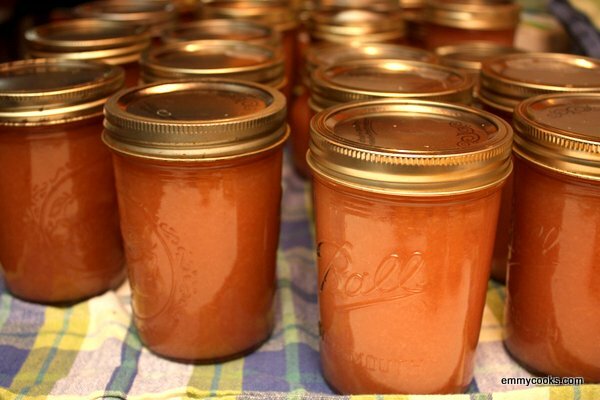 How to Make Applesauce: Here’s the thing about an applesauce recipe: I’m not going give you one. It’s just one of those things that you have to make by feel and taste. Your apples might be juicier or drier than mine. They might be sweeter or more tart. You might like a chunky sauce or a smooth puree. Here’s how to get exactly what you want. Step 1: Get Apples If you are choosing your apples for applesauce, ideally you want to select a few varieties of sweet apples. Using multiple varieties will give your applesauce a well-rounded flavor. If you don’t get to choose your apples (say, you’re using up the apples from your tree), no worries. Step 2: Prepare Apples The big question is: to peel or not to peel? If the apples aren’t organic, I say peel them. If they are organic or unsprayed, think ahead to what you want the final texture to be. I don’t mind leaving peels in my applesauce; I think they give a nice chunky texture after a long cooking time. The rest of my family disagrees with me. If you have a food mill you can strain out the peels after cooking the sauce, which is easier but leaves you with a uniform (not chunky) sauce. If you want a chunky sauce with no peels, peel your apples before cooking them. If you leave the peels of red apples in during cooking (whether or not you strain the sauce later), the applesauce takes on a nice rosy hue. Whatever you decide about the peels, chop your apples into quarters and remove the cores. Step 4: Applesauce Texture If you peeled your apples, you can now decide between mashing them coarsely (with a potato masher or a wooden spoon) and creating a finer-textured sauce (with a food mill or immersion blender). If you haven’t peeled your apples, you can decide between leaving the peels in or straining them out with a food mill. Of course you can also just blend the peels right into the sauce, but that creates a bit of a coarse texture that I don’t personally love. Step 5: Flavor the Applesauce Now it’s time to get out a bunch of spoons and start tasting. These days we often can at least some of our applesauce completely unsweetened and unflavored as baby food, but you can sweeten it to taste with sugar (and if it ends up too sweet you can balance the sweetness with lemon). My favorite flavorings to add to applesauce are cinnamon and vanilla, which you can use separately or together (I like both); you can also add any other spice that you’d be happy to find in an apple pie (think nutmeg, cloves, ginger). If I want to experiment with a flavor I often use a little bowl of applesauce to try it out so I don’t take the whole batch in a direction I don’t like. Season and taste until it’s perfect. Step 6: Applesauce Storage If you eat it right away you won’t have to store it! Otherwise applesauce can be frozen (just use a straight-sided container and leave a bit of room for it to expand). If you are canning your applesauce in a water bath canner, process pints for 15 minutes or quarts for 20 (yes, it’s safe to can without added sugar). What a lovely kitchen ritual! As a graduate student, I still think of fall as the real beginning of each year. I love these posts that are so honestly general – sometimes a precise recipe is really not the point, but understanding the process is. I think it’s great. We make a lot of applesauce (cinnamon yes, vanilla next to try!) – I have never known that I could cook it down to apple butter! Thank you thank you! I love homemade applesauce! I have a bunch of orchard apples that weren’t crisp enough for our tastes, so applesauce is in the future. I really wanted to make it last week, but ran out of time. Applesauce this week! I don’t expect to feel the urge to make apple sauce, but if I do I will definitely look up this outstanding post! I like very much how you explain what all the variables are rather than just providing a recipe. As for keeping a journal: my blog of course, and besides that we also keep a journal of longer trips abroad with GPS coordinates of all important locations. What a sweet post. And the applesauce looks grand, too. I made some when we were in Normandy last month (land of the groaning apple trees!) and hated that I had to throw some out at the end of our stay. Love this tutorial Emmy, I have so many apples right now, I really just need to get into it! I loved reading this post. I agree, you don’t need a recipe for applesauce as it’s one of those things that seems completely natural to make. I’m afraid, though, that I took this for granted, something I realized when my daughter phoned me one day recently. She wanted to make applesauce for the baby and needed the recipe. I’ve been planning an applesauce post for my blog, but we ate all the apples we picked in our last outing to the orchard. I need to buy some more!